Our program provides accurate fuel tax calculation and we support all 48 states that participate in IFTA. This will eliminate the most common errors that occur with the IFTA Quarterly Tax Return, which are mistakes in math calculations. Our simple entry for odometer readings and the ability to maintain distance and fuel records online, makes it easy to keep track of your mileage and fuel purchases. If you have any questions, please contact our US based customer support team in Rock Hill, SC at 704-234-6005 or email us at support@ExpressIFTA.com. We are an industry leader offering truck tax solutions with the best value and pricing in the trucking industry. 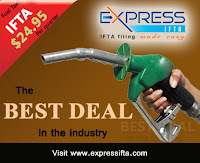 With ExpressIFTA entering your mileage and fuel details has never been easier. Our program is easy to use and there is no cost to sign up and there are no monthly fees or contracts with ExpressIFTA. Q. Who qualifies for an IFTA license? Q. Why should I register for IFTA? Obtain a single fuel tax license for all of your qualified motor vehicles, authorizing them to travel in all IFTA jurisdictions; and file only one tax report each quarter with your base jurisdiction, reporting your fuel usage and mileage for all IFTA member states and provinces. Your fuel tax records will generally be audited only by your base jurisdiction. Q. Which taxes does IFTA cover? Q. Which fuels does IFTA cover? Q. What are the fuel tax rates for IFTA jurisdictions? Q. What fees must I pay under IFTA? The fees vary from state to state; check your state for their specific fee. Q. What credentials will I receive? Q. When are IFTA reports due? Q. Do I file a quarterly fuel tax report if I didn't run during the quarter? Q. What is the penalty and interest rate for filing a late quarterly fuel tax report? Q. How do I obtain a return? Q. What records will I need? If you have any questions, please contact our US based customer support team in Rock Hill, SC at 704-234-6005 or email us at support@ExpressIFTA.com. The IFTA license offers several benefits to the interstate/inter-jurisdictional motor carrier. These benefits include one license, one set of decals per vehicle, one quarterly fuel tax report for all vehicles that reflects the net tax or refund due. In order to obtain and IFTA license and decals you must submit an application to your base jurisdiction. The process varies from state to state, so check your base state to determine the exact process. Under the IFTA requirements, payments are made to the home office in which the office will distribute payments through other home bases. For your vehicle to qualify you must travel to and from two IFTA jurisdictions. You must also have gross weight and that weight must be registered; and it must combine the gross weight in excess of 26k pounds or have three or so axles on power units despite of its gross weight; or it must be a bus that is made to carry up to 20 or more passengers. Tax returns are required even if no operations were conducted or no taxable fuel was used during the reporting period. Returns that are not filed or not paid in full are considered late and will be assessed penalty and interest. Many people dread the thought of having to file their quarterly IFTA return but with ExpressIFTA you can quickly and easily keep track of your mileage, fuel purchases and more at no charge. Entering your mileage and fuel details has never been easier with our quick entry system. There is no cost to sign up and there are no monthly fees or contracts with ExpressIFTA. 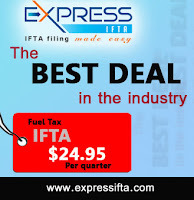 You pay only when we prepare your IFTA fuel tax return. You can log your trips as you run them, so you don’t have to spend hours doing it at the end of the quarter. Our program will do all the calculations for you; all you have to is plug in the data. ExpressIFTA makes fueltax reporting less taxing! To get started simply create an account and begin entering your trip sheet information, that’s it! If you have any questions along the way, please do not hesitate to contact our friendly US-based Truck Tax Team at 704.234.6005 or email us at support@expressifta.com. We are an industry leader offering truck tax solutions with the best value and pricing in the trucking industry. With ExpressIFTA entering your mileage and fuel details has never been easier. There is no cost to sign up and there are no monthly fees or contracts with ExpressIFTA. Our program provides accurate fuel tax calculation and we support all 48 states that participate in IFTA. This will eliminate the most common errors that occur with the IFTAQuarterly Tax Return, which are mistakes in math calculations. Our simple entry for odometer readings and the ability to maintain distance and fuel records online makes it easy to keep track of your mileage and fuel purchases. If you already use Express Truck Tax to file your Form 2290, when you log into your ExpressTruckTax account, you will see an IFTA button at the top of the page. Select this option, and click Go to IFTA. This will automatically register you with an ExpressIFTA Account. To Get Started, Click Begin. If you have not yet used our program, simply create an account with ExpressIFTA, all you need to do is enter basic information about the filing party such as contact information and EIN. You will also be asked to enter your base jurisdiction and IFTA license number. You will be able to complete this form online through our program within minutes and send it to your base jurisdiction. If you have any questions, please contact our US based customer support team in Rock Hill, SC at 704-234-6005 or email us at support@ExpressIFTA.com. Use Trip Sheets to enter your miles traveled and fuel purchased to complete your quarterly IFTA Return. ExpressIFTA made complicated Form easy. 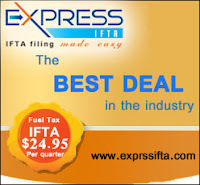 Prepare your IFTA return online with ExpressIFTA. If you have any questions call our customer support team at 704.234.6005 or email us at support@expressifta.com. An interstate motor carrier operating "qualified motor vehicles" between at least 2 member jurisdictions (The 48 contiguous states of the US and 10 Canadian provinces) must have an international fuel taxagreement (IFTA) license and decals issued by their base jurisdiction. To avoid penalty for late filing, the tax reports must be postmarked no later than midnight on the date indicated. If the last day of the month falls on a Saturday, Sunday or legal holiday, the next business day will be considered as filed timely. A quarterly fuel tax return must be filed even if the no fuel was used. You submit a “zero” report. Some states offer online filing for quarterly filing, while others require paper filing. Check your state requirements. ExpressIFTA made complicated Form easy. 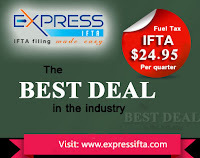 Just create an account with ExpressIFTA and file Quarterly IFTA Fuel Tax Return, if you have any questions call our customer support team at 704.234.6005 or email us at support@expressifta.com. Failure to file a IFTA Fuel Tax return, filing a late return, or failure to remit any or all tax due will result in a penalty of $50.00 or 10% of the net tax due to all member jurisdictions, whichever is greater. Interest is computed on all delinquent taxes dues each jurisdiction at a rate of 1% per month. Even if you have a net refund, interest still applies to each jurisdiction for any underpayment of fuel use tax to that jurisdiction and is calculated beginning the day after the due date of the return for each month, or fraction of a month, until paid. So the longer you are late, the more you will owe. The deadline for 2nd quarter IFTA returns was July 31st, so if you have not yet filed your return, you will want to file it not to avoid further interest. ExpressIFTA has made a complicated tax form easy. To get started simply create an account and begin entering your trip sheet information, that’s it! 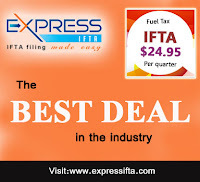 If you have any questions along the way, please do not hesitate to contact our friendly USA-based IFTA Fuel Tax Team at 704.234.6005 or email us at support@expressIFTA.com. 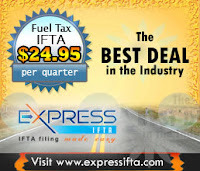 Learn how to add odometer entries for IFTA Fuel Taxes using www.ExpressIFTA.com. If you have any questions please feel free to call our customer support team at 704.234.6005 or email us at support@expressifta.com.